Peter Walker is a lecturer in History at the University of Wyoming who studies early modern Britain, the British Empire, and the Atlantic World. He received his PhD from Columbia University in 2016 and his MPhil from the University of Oxford in 2010. He held an Omohundro Institute Fellowship for research at Windsor Castle in 2017. What was the impact of the American Revolution on the British Empire? In the long run, it was easy for Britain not to dwell on the catastrophic rebellion of thirteen American colonies when the loss of the first empire was so quickly superseded by the acquisition of the second. This transformation was mirrored in George III’s own apotheosis: from a seeming imperial tyrant, to the man who lost America, to one of Britain’s most successful monarchs. In its immediate aftermath, however, the American rebellion appeared not an embarrassment to be forgotten but rather as warning to be heeded, creating both the need and the opportunity for reform. Among the spectacular variety of reforming schemes galvanized by the Revolution were a collection of lengthy, detailed proposals by an out-of-office Irish bureaucrat named William Knox, now in the Georgian Papers. These include: a thirty-page essay titled “Considerations on the Great Question what is to be done with America”, in which Knox insisted on the need to “throw out of our Minds all Ideas of Colonies and Colonization, antient and modern” and begin thinking of “the British Dominions in America” as “Provinces” instead of “Colonies”; a catty memoir of the failings and disfunction of Lord North’s government (“so inefficient an administration”), in which Knox accused Grenville for thinking “too much of England”, and the Board of Trade for paying too little attention to the colonies’ political and religious establishments; two plans for reducing the post-war public debt; a letter on the importance of fully establishing the colonial Church of England (a means of “repressing the prevailing disposition of the Colonies to republicanism”); and a proposal for an imperial communications network (by which Britain could govern its colonial subjects just as “the Great Governor of the Universe” quietly guides “us mortals… to perform what he has ordained”). How did these writings end up in the archive of George III, and what does their journey there tell us about Knox’s efforts to enact an imperial counterrevolution? Individually, these essays contain a mixture of specific policy proposals, rumination on the causes and consequences of the American rebellion, and abstract theorizing about the nature of empire. Together, they constitute a comprehensive plan for a reformed empire characterized by royal and aristocratic power; administrative centralization, systematization, and efficiency; free trade within the empire; the economic development of Wales, Scotland, and Ireland and their integration into the imperial metropole; the uniform establishment of the colonial Church of England; and the toleration of Roman Catholics. Knox claimed to be mending the underlying defects which had been exposed by the American rebellion, but he also insisted that the loss of thirteen American colonies, together with the Irish Revolution, created the opportunity to make the Empire anew: these events had made “such a change in our circumstances, that the old mode of treating our Dependencies must be exploded and a new System formed better adapted to our present situation”. Knox’s conservative language and goals thus belies the ambition and radicalism of his ideas. The author of this program, William Knox, is thoroughly documented in the historical record yet remains a curiously elusive figure: an anonymous but highly influential government functionary. Born in Ireland in 1732, Knox served as first the provost-marshall and then the London agent for Georgia, where he acquired a large slave plantation. He later claimed that, when he first arrived in the colony, he was astonished to perceive “a total want of plan or system in the British Government” of America. In 1763, he emerged from a number of self-promoting imperial fixers and “experts” to influence the Board of Trade as it sought to impose order on the Empire, notably in its decision to promulgate the proclamation line. He worked as a pro-government pamphleteer during the early stages of the imperial crisis, was dismissed by the Georgia assembly for publishing a defence of the Stamp Act, and acted as a vocal defender of slavery on behalf of the Society for the Propagation of the Gospel. He joined the government as undersecretary of state for the American department in 1770, where he worked under Hillsborough, Dartmouth, and Germain, not only quietly managing the day-to-day running of the office but also shaping policy in important areas. Closely associated with the coercion of America, he lost his job in 1782 when the American department was abolished by the incoming conciliationist Prime Minister, the Earl of Shelburne. Knox is the subject of a 1977 biography by Leland Bellot: a work of Namierite scholarship which (despite its title) downplays Knox’s ideas, and moreover quickly loses interest in its protagonist with his loss of office in 1782 and Britain’s loss of the thirteen colonies the following year. Yet, as the presence of these proposals among George III’s papers demonstrates, Knox continued his efforts to influence imperial policy from what Bellot describes as his “retirement”. Knox began his correspondence with George III on the day he left office, asking him to “pardon his presumption in making this last use of his key of the Box of the American Department”. Over the following decade he continued to write to the King from Pembrokeshire, where, he reported, his vision for imperial reform was locally manifested in his efforts “to promote the culture and improvement of the country by the establishment of an Agricultural Society, and the amendment of the people’s morals by the establishment of schools for the instruction of the children of the poor”. GPP/Main/6224: Map of Knox’s proposed communications network, 1787. As it became increasingly apparent that his ideas carried little weight with the Pitt administration, which he believed was mangling the brilliant policies he had initiated as undersecretary, Knox instead sought to make his voice heard by sending his proposals directly to the monarch. These proposals were not written for George III. The “Considerations on the Great Question”, for example, was written during the early stages of the American war when Knox was still in office, and was circulated around the ministry, only to become irrelevant as Britain’s military fortunes took a turn for the worse. It was only sent to George III after the end of the war, but as Knox explained, the essay’s objective – understanding and remedying the “Secret Causes” of the American Revolution – remained as urgent as ever. Knox did, however, edit the proposals for the King’s use, removing the “detailed calculations” to render his political economy comprehensible, and diagramming his proposed imperial communications network on a printed map of the Atlantic Ocean. Knox was certainly hoping to secure compensation for the American property he lost during the war, but – more than that – he was surely trying to exercise political influence through informal channels. He thought he knew how the Empire worked and he could not bear to be irrelevant. How George III reacted to Knox’s overtures is harder to determine as his replies do not survive. Was Knox ignored, politely humoured, or actively encouraged? In any case, Knox changed his strategy in 1789, publishing a 450-page collection of the various proposals, hints, and schemes he had authored as undersecretary, together with an attack on Pitt for failing to heed this trove of political wisdom. The same year, he announced his intention to seek election to the House of Commons, although this never materialized. He also resumed his activities as a pamphleteer, publishing against both the Pitt administration and Parliamentary reform, and in favour of the slave trade, the proselytization of slaves and Native Americans, the emancipation of Irish Catholics, the war with France, and the reform of the Church of England. It seems likely, then, that Knox abandoned his efforts to lobby the King – perhaps he was rebuffed, or perhaps he gave up in light of George’s deteriorating health and withdrawal from public duties – and instead took his program for imperial reform to the reading public, somewhat ironically given his insistence that the American rebellion was caused by an excess of democracy. Although Knox never succeeded in coming in from the political wilderness, his imperial vision is of interest not just as a counterfactual – the Empire that might have been had the King’s troops triumphed in America – but also as a voice guiding the reform of the Empire in the aftermath of American independence. GEO/MAIN 15540-76, [William Knox], “Considerations on the Great Question”, . Copies also survive in the Germain papers at the Clements Library, the Dartmouth papers at the Staffordshire Record Office, and the Gower papers at the National Archives. The essay was published in 1978: “William Knox Asks What Is Fit to Be Done with America?”, ed. Leland J. Bellot, in Sources of American Independence: Selected Manuscripts from the Collections of the William L. Clements Library, ed. Howard H. Peckham, 2 vols. (Chicago: University of Chicago Press, 1978), vol. 1, pp. 163-87. These and the following essays were not printed by Fortescue or Aspinall, who both decided against printing enclosures. GEO/MAIN 4879-4902. [William Knox], “Anecdotes and Characters of the Late Administration”, 1782. GEO/MAIN 15236-7. [William Knox], “Ideas of Two Plans for Reducing the Public Debt”, [1784?]. GEO/MAIN 6288-9: William Knox to William Pitt, Aug 7 1787 [Aspinall n. 383]. Knox printed this proposal in 1789: William Knox, Extra-Official State Papers. Addressed to the Right Hon. Lord Rawdon, and the Other Members of the Two Houses of Parliament, Associated for the Preservation of the Constitution and Promoting the Prosperity of the British Empire. By a Late Secretary of State (London, 1789), Appendix 1 Part 1, pp. 12-18. GEO/MAIN 6223: [William Knox], “American Correspondence by Packets”, . This was also included in the Extra-Official State Papers, Appendix 1 Part 1, pp. 21-49. Knox, Extra-Official State Papers, vol. 2, p. 11. S. Max Edelson, The New Map of Empire: How Britain Imagined America before Independence (Cambridge, MA: Harvard University Press, 2017), pp. 47-54. Franklin B. Wickwire, British Subministers and Colonial America, 1763-1783 (Princeton: Princeton University Press, 1966). Leland J. Bellot, William Knox: The Life and Thought of an Eighteenth-Century Imperialist (Austin, TX: University of Texas Press, 1977). GEO/MAIN 4710: William Knox to the King, May 1 1782 [Fortescue n. 3706]. GEO/MAIN 6081: William Knox to the King, Oct 4 1785 [Aspinall n. 251]. 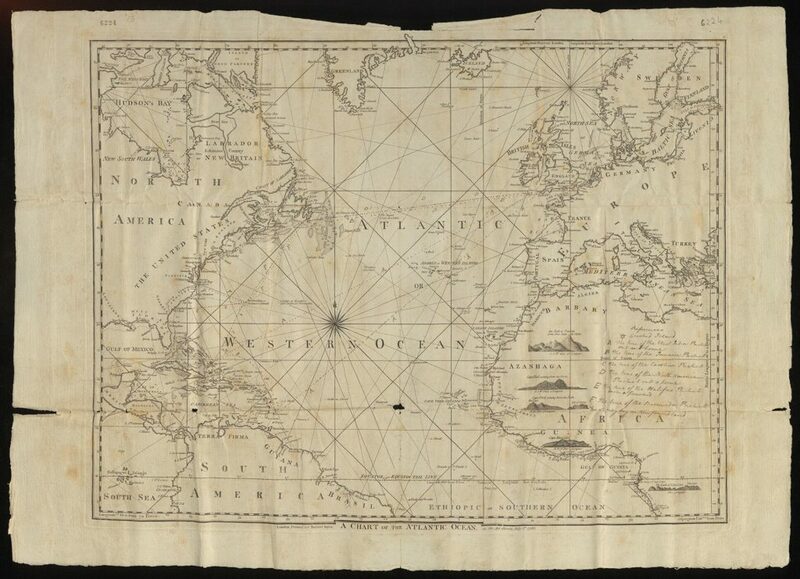 GEO/MAIN 6224: Chart of Atlantic Ocean . GEO/MAIN 6639: William Knox to the King, n.d.  [Aspinall n. 569]. See the bibliography in Bellot, William Knox, to which should be added [William Knox], Consolations to British Subjects under the Burdens of the Present War. By an Old Statesman, but now a Country Gentleman (London, 1793).